My journey begins with the line, as it is the ray of light for me. I celebrate energy and movement of line in my paintings, drawings, and sculptures. I have always followed an inner rhythm and, by listening to it, I draw a continuous line, sometimes forming compositions with connected figures and other times abstract formations. 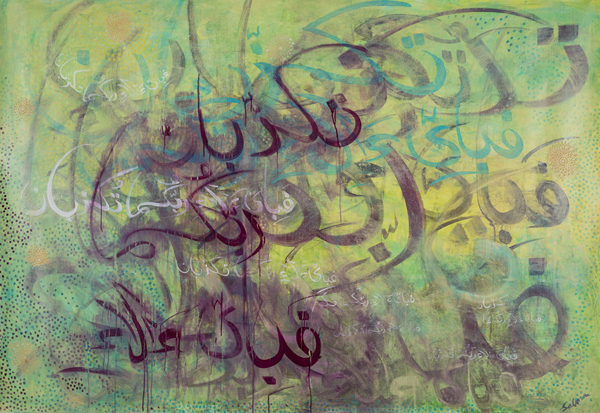 Since my exposure to Arabic calligraphy, my line has become more lyrical and melodious. I am using the same stroke of the brush for these letters as I do for suggesting human forms. Both are fluid, as if temporary expressions of the eternal universal vibration. I find myself yearning to find infinite possibilities of the lyrical line itself on my large canvases. I just want to plunge myself into the pleasure of contemplating the abstract flow of the swelling lines, and to form compositions of lines and fields within given space. I enjoy the celebration of calligraphy through lyrical visions. 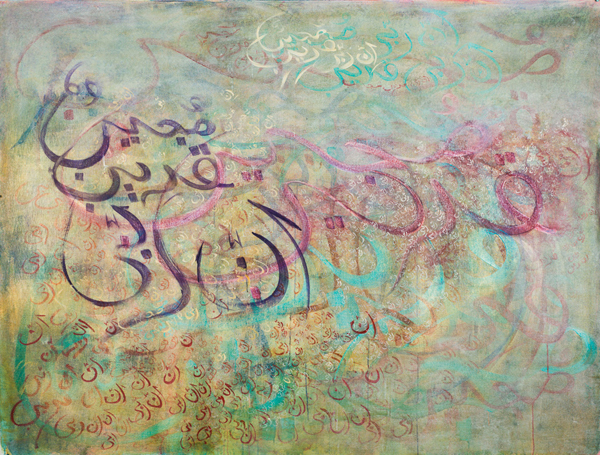 The energy and movement of Arabic calligraphy, powered by positive messages from sacred text, inspired me to create these newest paintings. My work is created through an ongoing process of introspection that involves action and reaction to a variety of materials. I work with several thin layers of acrylic paints, and attending to the details in-between the layers, use patterns and calligraphic strokes. In the process, I infuse my paintings with muted or subdued mystery. For me, creating art means getting physically involved with a piece: scratching, sanding, and layering, and then adding details in pen and ink or with materials such as paper, modeling paste, papier mache, or copper plate. With these tools I create paintings that incorporate my cultural and spiritual viewpoints on or interpretations of contemporary social issues. My work contains a vague suggestion of hide-and-seek, where lines and space bond both to show volume and deny it, all at the same time. It is the line that performs both as mark and contour, charging space. My paintings are visually flowing, undulating spirals through space in hushed and deep tones, connecting figures and ground in a spiritual union, synthesizing contour, color, and space. 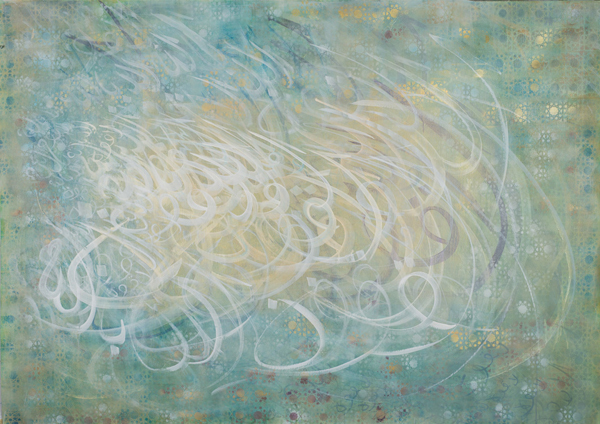 I completed this new series with Arabic calligraphy on large unstretched canvases with transparent layers of acrylic paints. The works hang like tapestries. Salma Arastu, born in Rajasthan, India, has been creating and exhibiting her paintings internationally since graduating with a master’s degree in fine arts from Maharaja Sayajirao University, Baroda, India, in 1975. Her work, with its continuous and lyrical line, is influenced by her native culture and her residence, following marriage, in Iran and Kuwait. Arastu came to the United States in 1987. She lives and works in Berkeley, California. Born into the Sindhi Hindu traditions of her native India, Arastu embraced Islam after her marriage. At birth, she was given the life-defining challenge of a left hand without fingers. Seeing the unity of an all-encompassing God, she was able to transcend the barriers posed by religious traditions and culture and cultural perceptions of disabilities. Arastu has been painting more than 30 years and has exhibited her work in at least 40 s0lo shows in the United States and abroad. 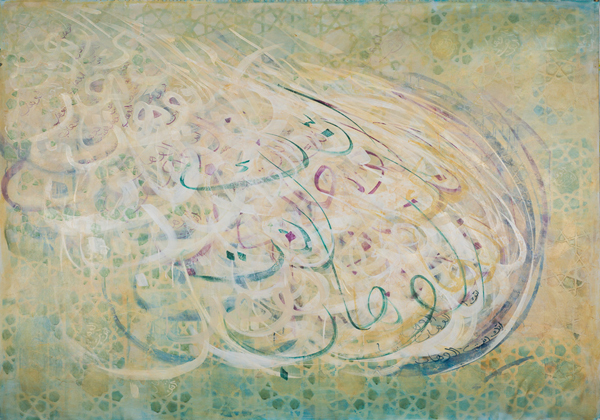 Her awards and honors include a six-week residency in 2000 in Schwabish Gmund, Germany, and a 2012 East Bay Community Foundation grant to create new artworks for her project Turning Rumi: Singing Verses of Love, Unity and Freedom. The grant enabled her to prepare two exhibitions and to publish a book last year. She published her first art book, The Lyrical Line (Half-Full Press, Oakland, California), in 2009. In 2010, Arastu’s eight-foot-by-four-foot metal sculpture Dancing with the Stars was installed at the Port of San Diego, California; currently, it is on display in San Rafael, California. In 2011, a second sculpture, Celebration of Arts, ten-feet high and six-feet wide, was installed at SteelStacks, an arts culture, and education campus on the site of the former Bethlehem Steel Corporation in Bethlehem, Pennsylvania. A poet, Arastu published a collection in Hindi in 1980, through Sahithya Kala Academy in India. 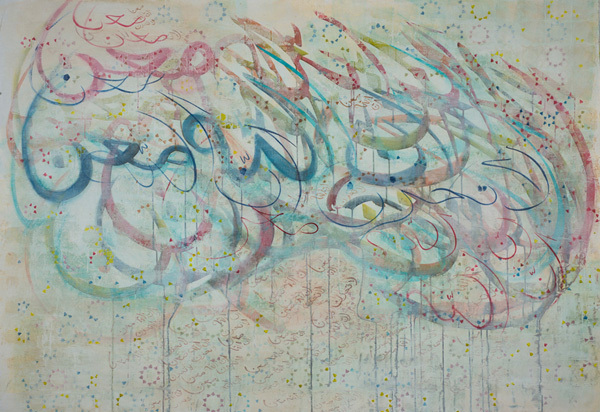 In 2013, The Berkeley (California) Public Library presented her in “Artist and Author: Salma Arastu and the Poetry of Rumi: Art Exhibit and Readings”. Represented in a number of private and public collections, both in the United States and abroad, Arastu speaks through her paintings, sculpture, drawings, and poems to the dual notions of human universality and individuality. 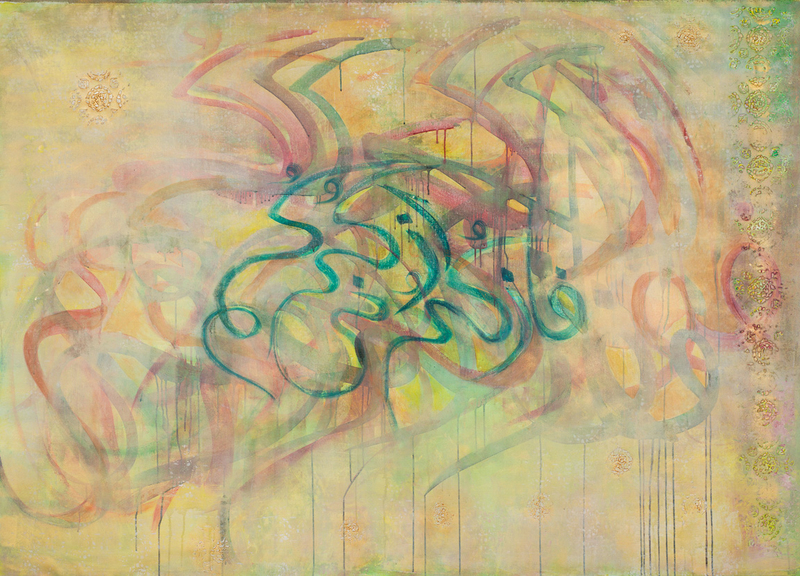 East and West come together in the spirit of harmony as she blends Eastern spiritual longings with Western painting techniques. 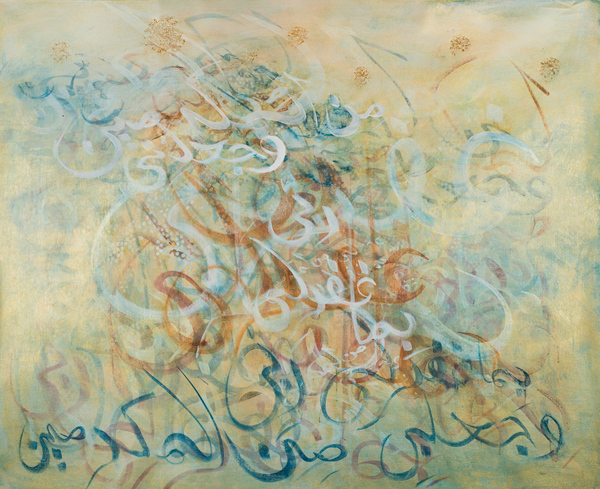 Her extensive travels and experiences with diverse communities, folk art, miniatures, and Arabic calligraphy are all strongly represented in her work, which deeply respects, honors, and celebrates the uniqueness of every person. Arastu’s work may be seen this year in solo shows at Robert Graves Gallery, Wenatchee Valley College, Wenatchee, Washington (February 2014 – March 2014), and Triton Museum of Art, Santa Clara, California (September 2014 – November 2014). 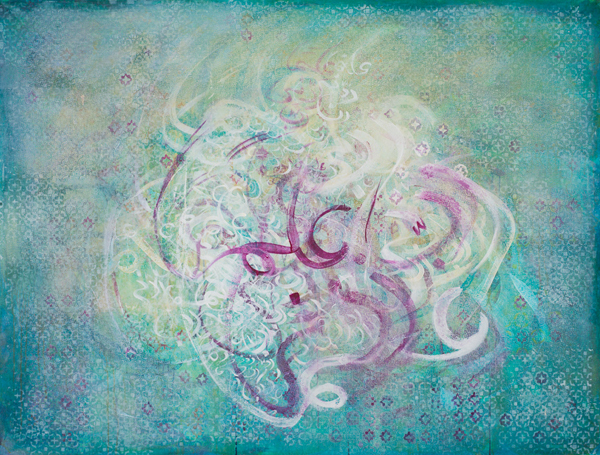 Her work also is in the group exhibition “Sacred Voices” at Canton Museum of Art, Canton, Ohio (December 2013 – April 2014).